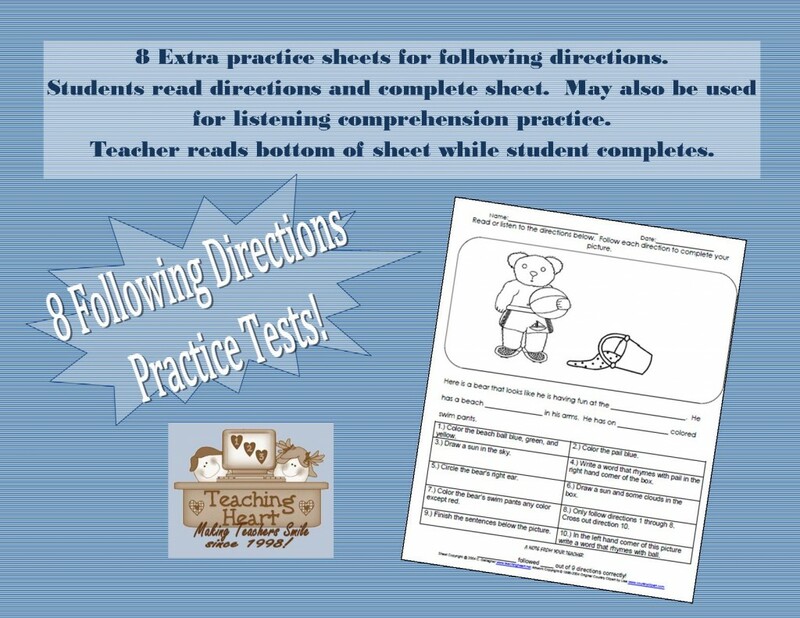 Below you will find pictures of centers, various links about centers, and printable centers that you may use in your classroom! I have three leveled reading groups. I run reading groups from 9:30 - 10:50. On the board I write the students jobs (things they are doing when they are not at reading group). The jobs look like this. Also, I have to note that they work on the jobs in order. After reading group they usually have an independent activity to complete. They must do that before they start back on jobs. That is not on their job list but they know that it takes first priority! 4.) Unfinished Work - They have two folders at their desk. One is a take home and one is unfinished work - usually art projects we started as a class and they need to finish up. 5.) QUIET Choice - If they get all their reading and jobs done they may do quiet choice (about two of my students get to this regularly). During this time they may write in their journal. Draw a picture. Read a book. Work on Reading Quilt. Do a free time sheet. Free time sheets are just various word searches, mazes, crosswords, or coloring pages related to a theme. At the moment in the free time box you will find Columbus, fall, and Halloween activities. I also copy theme math sheets out of teacher resource books and place them in the box. Order Draw Write Now Books - Click on the book to learn more!!! I usually have 6 centers going on in the room plus I select three students each day to use a computer. The students at the computer select a free online math game from our class math page or they are sent to a computer that I have loaded with software that meets their needs. Each student has a colored dot on their desk. The dot corresponds with a center on the chart. The dots on the students desk stay the same. The center dots change every day so that a student does a different center each day. When the student gets to center on their jobs list. They get their center folder (I have them place all their center sheets in this folder. Periodically, I remove their finished work and check them. About once every two weeks.) After they finish the center and the center sheet, they place the sheet in their center folder. Next they clean up their center and put their center folder away. Listening center - In a cubby you will find four choices of books. A book and tape recorder are in bags. (I bought walkmans at Wal-mart for five dollars each. Students have their own listening center) The student takes the bag of their choice and a listening center sheet. They listen to the book and then fill out the sheet below. The sheet asks them the name of the book and author. It asks them to draw their favorite part of the story and one sentence describing the picture. It also asks them to tell if they liked the book. After they finish the sheet, they place the sheet in their center folder. Next they clean up their center and put their center folder away. I was in a classroom the other day where the teacher was given a grant to purchase IPODS for her listening center. I was amazed at how well the kids were able to use the ipod in the listening center. If you are familiar with an IPOD, the idea is to set-up a playlist for each week. the student listens to the playlist for the week while reading along. 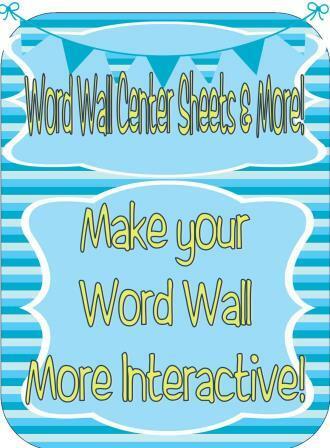 Word Wall Center - I have various word wall activities that I have the children complete. I change this center weekly. student writes word wall words in ABC order. student determines the number of consonants in a word wall word. student uses the letters of his name to complete this word wall activity. 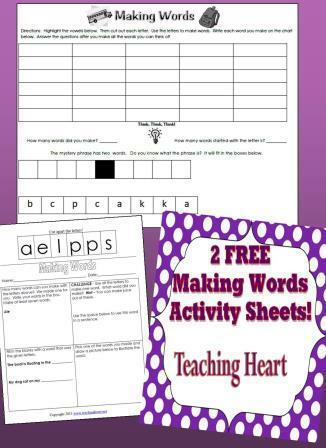 Student activity sheet - student places words from the word wall in the correct. Student picks eight word wall word. He uses all the letters in the word to form new words. Student picks six word wall word. He writes and illustrates those six words. Student picks seven word wall word. He uses the key to see how much each word costs. Involves simple adding. The activities above are found in our Word Wall Packet. You can see more pictures of the other items in this packet by clicking here! Word Wall Packet can be purchased by clicking here! Reading Center - In each center folder is a book form. The student is assigned a basket of books to pick from. They pick a book from the basket. They read the book and then fill out their record sheet in their center folder. 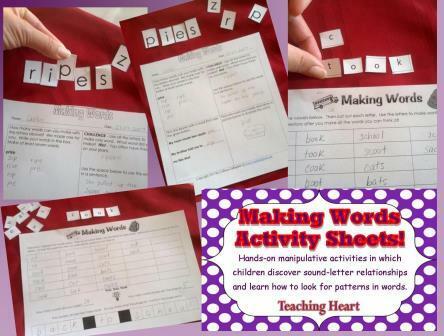 Making Words Center - The student goes to this center and removes a bag of prepicked letter tiles and a Making Words center sheet. They use the letters to make a four words that they must write on the sheet. One word must be 2 letters long, two of the words must be three letters long, the last word need to be 3 or more letters long. The letter tiles this week are p u m p k I n a. After they write their words on the sheet, they then must circle two and use the chosen two in a sentence. Also, I have had premade sheets in the past that had the letters on them. The students grabbed the sheets, cut the letters, and then made five different words. They had a challenge of guessing what word could be made with all the letters. Then they pick two of the words they made and use it in a center. Making Sentences Center - At this center, the student grabs a bag of index card. On each index card in a few words. They need to figure out how to manipulate three cards to make a sentence. The sentence may be silly. They must do this twice. On the center sheet they will write the two sentences and draw an illustration to match the sentence. Like all the centers, they must complete the sheet, place it in their folder, clean up the center, and put their center folder away. 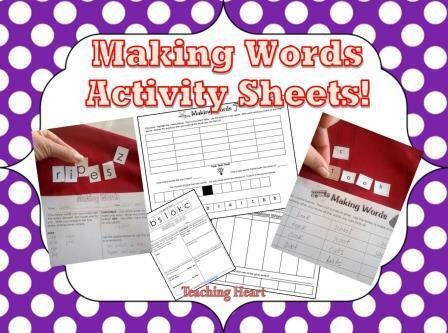 Making Words Activity Sheets - Over 30 Hands-On Sheets! Click here to learn more about this set! 2 Free Printables from this set that you can use and try - If you like them - click here and get the set! Click to get the set of 40 sheets! Poem Center - Each week I select a poem and place it on large paper. The students must write the poem in their journal and then draw a picture of what they see in their mind when they read the poem. Sometimes I may ask them to circle rhyming words or words that begin with a certain sound. Pocket Chart - The first few weeks of school the students went to the chart and counted the money in each row and wrote it on the given sheet . Now they go to this center and arrange 4 pictures in correct order. Then they sketch each picture on the given center sheet. Finally they write a transitional sentence for each picture. I change this center often. I add new activities to match something we are learning in class. Click here yo learn about this center. This has worked great for me. The students do a perfect job during this time. The first two weeks of school I did not teach reading groups. I spent that time teaching the students what to do while I taught groups. They had to learn the routine. At first it is hectic and there are lots of questions. After about a week most of the students have the routine and understand all the centers. Also to keep it quiet during this time, I run a point system all day. Before I start groups I tell the students that I will pick my favorite group and give them 10 points. It is always quiet and the students are very hard at work. This is long - I hope it helped a bit... The book What the Other Kids are Doing While I Teach Small Groups was helpful to me and may be to you. Click the title to learn more! 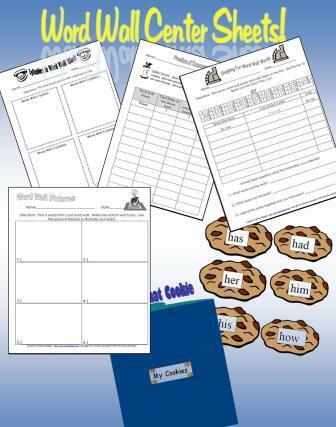 Tons of ready to use Graphing Centers Can be Found Here! These make great centers too! T Here is a number of the day sheet that would be fun morning work for grades 1-2. When I taught Everyday Math we always worked with the number of the day, seeing how many different ways we could display it. This worksheet stems from that. Need back to school ideas  click here! Colleen how do you do your point system? i find it really hard to keep the noise level down when they are doing their centers. Hey! I use it all day and everyday. Very effective. My students sit in teams. I have 22 students. There are 4 teams. 3 of the teams have 6 at them and 1 has 4 students. Each team has a group number. Before I start reading groups, I tell them I will be looking for my favorite group (quiet and on task). That groups gets ten points and the second place gets five points. After each group I offer positive verbal feedback (Wow, look at group 2 everyone is working hard and their group is very quiet). There is no more than 4 kids at a center and most of the time all students are not at the center at the same time because some work faster than others. I never have trouble with noise level at the centers. After reading groups, I go to the board and transfer the points under their specified group number. Throughout the day I offer points to groups that are ready to learn. For instance during a math lesson, I tell them I that I am looking for the groups that are participating and on task during the lesson. I just make it up as I go - adding points for positive things the groups do. At the end of the day we count the tally marks and the first place group wins for the day. They get a star on their chart. When a student fills their chart they get to go shopping in our class store for one item and then they get a new chart and the process starts again... The next day starts with a clean slate and any team can win. I love it, it works great and the kids seem to like it. Hope this helps. I was looking at your website center area. I saw where you used the book Draw Write Now. Is this the same as Think! Draw!Write!? I found this book the other day. I thought it was the book you had talked about on the site. This book requires the students to draw, then they are to write a story. At the beginning of the year, it would be better to model the stories, and then have them rewrite the story and illustrate. Is this what you do? Thanks for your help. Your website is great!!! The US began in the East. I write the passage on the board, we read it, & talk about it. The students then, as one of their jobs, while I am in small group, rewrite the passage and add at least one more sentence about the topic. Then, if they finish all their other jobs and centers they must illustrated with a picture. The book comes with a how to draw page after the paragraph. I copy this off for the kids to use. The kids love this and their drawings turn out so good. Sometimes better than mine. Okay more than sometimes :) Tee-hee! This is different from Think, Draw, and Write in that it is a handwriting and illustration activity. Plus the paragraphs in Draw Write Now lead into great chats about history type topics. I try to put a picture or short film clip about the topic on my computer to show the class after we read the paragraph. Now Think, Draw, and Write - I don't use as much but I do like it... It is creative writing where the other isn't. The kids enjoy them and I do model a few examples and we brainstorm ideas of what to write about. I also let the children share their finished product if they wish. To learn more about these books, click the title! I use Draw Write Now for cursive. I rewrite the message at the bottom in cursive, and do the directed art at the top. It has really shown me who is not able to follow simple instruction, and the children who focus have not only improved their cursive, their listening and drawing skills have improved. I used these books to do a Symbols of America study in April and May, one a week. We took the bald eagle from another book for the cover. I posted the students' writing each week, and then saved the papers. Looked good for Open House. What do you do in your Math Centers, Language Arts Centers, Reading, etc. They typically are WORD WALL, POEM CENTER, MAKING WORDS CENTER, POCKET CHART CENTER, GRAPHING, MAKING SENTENCES, READING CENTER, and LISTENING CENTER Usually, a sheet accompanies the center. The center is pretty hands on except for the sheet. Computer and Pocket Chart Center will often contain science or social studies type centers. Many of my products could be put out as centers. Click Here to Learn More! I had one math center; it was always hands-on. Everyday Math is full of games that go with the lessons (you will know what I mean once you see a manual). Many times I would teach a game, we would play it once as a group and then I would put it in my math center for the kids to use. Directions. Each player cuts apart a copy of Math Masters, page 3. Partners combine their cards. 1.) Players mix the 32 cards and place them face down between themselves. 3.) The game ends when there are no cards left to draw. The winner is the player that collects more cards. After you play the game a few times with a friend, place the cards and these directions in a Ziploc baggie. Now you can take them out some other time to play again. Many centers can be found on the Teaching Heart Instant Packets! Check them out here!!! Get all Teaching Heart Products on CDROM (DVD) or On a Zip Drive! & ALL Teaching Heart Packets! Save BIG - HUGE SAVING!!!! Learning Centers in a Can! Learning Centers on a Clothesline! Here are some great resources and are ready to go easy centers!!! Friday is catch up day for centers not completed on the assigned day. healthy heart, rocks, maps, etc. Some centers are hands on and some are paper activities. wisely on the report card. I hope this helps you. This is an hour after lunch 12 - 1 p.m.
Word Wall and Guided Instruction. in their own areas of the room doing their own thing!! scroll to center and look for the free sign! Hang Out with a Good Math Problem! Give Me a Double-Scoop of Contractions! 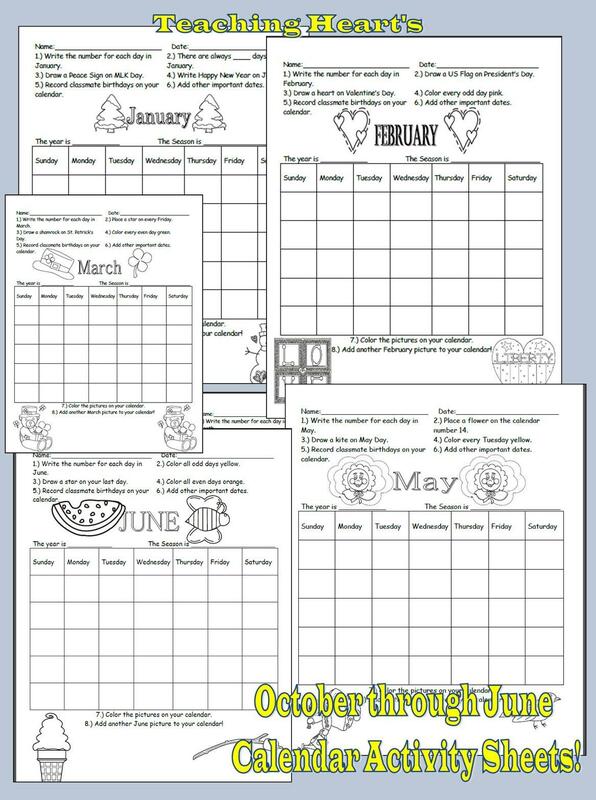 Graphing Center - 9 free printables!!! Reading Learning Centers for the Primary Grades. The Complete Learning Center Book. Around the Clock Here is a center game to reinforce clock numeral placement. For each game board, glue a construction paper clock to a colored background. Label each of several chips (in sets of 12 chips) with numerals 1 - 12. In turn have each player roll a 12 sided die, then cover that number on her clock with the correctly labeled chip. If a player rolls a numeral that has already been covered with a chip, she must pass the die to the next player. Continue play until on numerals on each clock are covered. French Fried Counting Getting an order of fries can add up to counting fun for your students. Start collecting fry containers. Then write a different number on each box. Make fries by cutting yellow sponges into strips. Place the boxes and fries in a center. To do this activity, a child places the appropriate number of fries in each box. Jars of Learning Gather some jars that could be used for canning. For each jar you gather think of a fruit or veggie to make out of colored paper (apple, grape, corn, banana.) Now cut out the shapes of the veggies and fruit. For each fruit or veggie jar think of an activity to place on the jars. For instance, one jar may be called apple activities. You would cut out apple shapes and label the jar appropriately. You may choose to write math problems on the apples. The student will take the jar and complete all the math problems on another sheet of paper. You might choose to name another jar corny questions and place corn cut-outs with questions written on in the jar. The student will take the jar and answer the questions on a sheet of paper. Make as many jars as you would like (be creative) and place them in a line on a shelf. After the sheet is finished and turned in, the student may eat her math! Finger Spelling This activity is so much hands on fun! Place a plastic shoebox, a can of shaving cream, and a list of current spelling words at the center. A student sprays a small amount of shaving cream into the shoebox and uses her finger to write the spelling word she sees. Or a friend tells her a spelling word and she spells it without looking. After she is sure the word is correct she spreads the foam around to erase the word, then repeats the procedure until all the words have been spelled correctly. Your thinking "messy" aren't you. Actually, I did this with a life skills class using numbers and all you need to do or have the student do is wipe it up with a paper towel and the shoebox is ready for the nest student. You may want to have four or five shoeboxes in the center. If your students did not like to practice their spelling words before, they should after this!!!! Sequencing Hang-up Hang a clothesline in your classroom and gather a set of clothespins! Program a set of seasonal shapes with desired vocabulary words or numbers; then laminate the shapes for durability and store them in a clothespin bag. Also make an answer key for self-checking and place it in the bag. A student sequences numbers or alphabetize words by suspending them on the clothesline in the correct order. 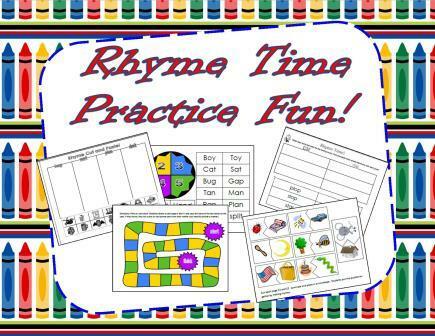 Students won't have any hang-ups about sequencing practice with this clever activity! Dictionary Detectives If you are working on dictionary skills or looking for a way to introduce dictionary skills here goes! Post a list of spelling words, vocabulary words, or content words at the center. Place several dictionaries, pencils, and a supply of writing paper at the center, too. have the students look at each word on the list and then write the guide words for the page where the word was found. Then have the student repeat this for additional words. A good idea is to provide an answer key at the center so the students can check their work. Some Ideas From Other Teachers! Literacy/Learning Centers! I try to keep my eyes open for chats about the topic of centers. I then add them to this area. It is great to read ideas from other teachers and maybe then use part of their idea or modify an idea to meet your needs. We are very lucky that teachers are so willing to help those that are looking for ideas. Here are some good ones I have found on mailrings and chatboards for teachers!!!! Thanks to all the teachers that have ideas below... You are helping many! 2.Finish these patterns: square triangle circle square triangle circle square ______ ______ circle oval oval circle oval oval circle ________ _________ Make up one more pattern using 2-dimensional shapes. fun! We will put these pictures up on thebulletin board. 5.Use a set of tangrams to create a design. Trace around theoutside of each shape. a cube has 4 corners. Think about their edges, vertices, faces, and if they slide, stack or roll. 7.Use a geoboard and create a shape with 1 elastic. Copy the shape onto dot paper. Now use 2 elastics to create a shape and copy this design onto dot paper. 8.Use pattern blocks to trace different shapes out of construction paper. Use these shapes, string, straws to design a geometric mobile. 2. Using a basket of pattern blocks and a baggie of pattern block puxxles try this activity. Fill in the first puzzle using the shapes indicated. Now, using the same puzzle design, recreate using other pieces by ignoring the interior lines and just following the outside boundaries. Count and record how many you used of each shape. way. Try it again with another friend. Remember to count and recordhow many you used of each shape every time you recreate a new puzzle. Children play this game in pairs. Children take turns rolling the die and moving their game pieces around the board. I see many people are taking about centers. I have done them many ways. (free choice, by catergory, by group) I have been working on my centers since I began teaching. I have a workable solution but it changes every year. I find some classes need different amounts of control than others. This year I have a very nice class that can easily stay occupied for up to 1 1/2 hours. This class loves to listen to stories on tape and play games so my stations are set up to accomodate thier interests. I am horrible at writing but this is a fair idea of what I do almost daily. Groups vary in size from 2-3 to a maximum of 6-7. Each group is a color name. Roughly the lighter the color the easier the material they are given to work with. I have a chart with group assignments on the board. Each station has a colored game for that group. Yellow group always takes the yellow folder and so on. At the beginning of the year I teach every game at my station while the other students play games or put puzzles together or color. My goal the first week is to teach them to move from one table or area to the next with as little confusion or talking as possible. Slowly I add a game to each station. My games are all leveled so the beginning of the year the games are very easy and get progressivly more difficult. I make most of my own games but have been know to purchase games. (LAKESHORE). I do not alter the rules to the games but make them progressivly harder. I teach at a very low SES school so most my kids do not know how to play simple games. Setup - I have 4 stations. I try to have 4 groups of desks to tables to use but since I rotate room 4 times a year that is not always possilbe. I choose the areas for each station and then do not move them. It might be a carpet, group of tables or desks or just an area. My lowest group always starts at staionnumber 1 and moves on sequentially. This is easiest for them. I am always station 4. At the beginning of the year stations might only be 5-10 minutes at each station. By the end of the year they might last 25 minutes. It depends on the day. Stations - I have my games divided into comprehenion blending and segmenting skills, written communications, high frequency words. IN the past I was lucky and had a helper in the classroom for stations. I no longer have any help but used my aids with the High Frequencey games. Comprension - beg of year listening to books on tapes and coloring a book report. Later writing book report end of year reading books and writing a response to me about the book. I often read books on a casette and kids listen to me reading a book. This might even be a book from our reading series. I try to keep the book length abut 5 minutes of reading leaving lots of time for them to write me about the book. This is a great way to see what they are understanding. Blending and Segmenting - Beg of year. If I have enough computers (some rooms do not have any) I use computers for this station. If not I do amkaing words type activity. I record my voice on a tape. Kids play the tape and make the changes. They start and stop as needed. I also stress beg sounds at this station as well as memorizing patterns. I have many games I have made that use these strategies. One of the easiest is I found picture and put the name on the back (example a picture of a cat on the front CAT on the back). Kids sit at a cocokie sheet with magnetic letters and look at the picture. They use the letters to spell the word. For my lowest they might only be trying to get beg sound or ending sound and so on. I have lots of picture made and sorted by work family, vowel sounds, spelling patterns and so on. Written Communications - beg of year this might be dittos from our reading series (district mandates we use them so I do here) At the end of the year this is more a free writing area making up stories. I often leave a stuff animal or small plastic toy at each desk. They write me all about the item, or a story about the item. They can work on this for days. Each child as a folder (stored in a folder holder) at that station. High Frequence - Bingo with HF words, Wordo with HF words, Checkers with HF words and any other game I can think of. Kids take turns being the caller on BINGO or WORDO (tic-tac-toe with words). I control the words. They might be a spelling pattern we are learning, high frequency words or even wrods that I am hearing many mistakes on. Each group will have their own words so that they are working where they need to be. Kids love this station as they think they are playing games. My station - this is where I target skills a child or group of children need. It gives me a change to hear every child and work with them in a small group. I will also use this setup on days I need to test but I only have 3 stations and I call out indivuals to be tested. I see myself using this with some of the ideas I have taken from OSG. I can see her confrence time as similar to my station time. please add (I love hearing suggestions!!). 1. Proofreading--(everyday) This center had to be done first everyday. The students were given 3 sentences, poems, statements or 1 paragraph a day to proofread and correct. Mistakes included end marks, names, addresses, beginning capitals, any other grammar mistakes that had been introduced previously. These sentences were gone over at the end of the center period. I know that proofreading in isolation isn't necessarily the best way ! to teach grammar, but it is required on our standardized test (PACT). We thought this was the best way to cover grammar everyday. 3. Browsing Boxes--(Twice a week) The books in the baskets are books that the students have read during guided reading with me. These are books that are on the students reading level or slightly lower. The students are allowed to browse through these books and read ones that they are interested in. Ideally, all these books have been read with the teacher, but I put books from the same sets in the baskets. For examp! le, if I read an Amelia Bedelia book with a guided reading group, I wouldn't hesitate to put another Amelia Bedelia book in the baskets. I believe this keeps the students from getting bored with the choices. 4. Listening Center--(Once a week) I have one listening center set up with 3 head sets and enough books so that each can have a book to follow along with. This was the hardest to plan, because most of the books that we used, we had to make. However, the students thoroughly enjoyed listening to the stories and following along with them. Next year, I am planning to do something with the books every once in a while, such as write a different ending or something to get them a little more involved. 5. Partner reading--(Twice a week) The students partner read with someone in there center group, which is not in their guided reading group. The students are reading with someone who could be reading on a higher or lower level! . The studnets are allowed to pick any book (which does not have to be a browsing box book) to read, as long as they are reading. This one sometimes takes a little more guidance, but is very helpful for students to "practice" with someone that can listen and help. 6. Spelling center--(Twice a week) This center definately helps when cheering the words becomes mundane. In this center I had magnetic letters, a baking pan, and a magna doodle. Therefore two sets of partners could be working at one time. With the magnetic letters, the pairs of students were practicing spelling the word wall words for the week by "quizzing" each other. With the magna doodle, the students practiced spelling any word wall words. One student would call out some words and check them after the other wrote them, then they switched. On Friday's spelling test we test the 5 word wall words and 5 words from around the room, so this helped with both. 7. Accel! erated reader--(Twice a week) During this time the students were allowed to read and take AR tests. This is an incentive program in our school. The scores for AR seemed to go up, as well as the students interest with this center. I did not require AR test to be taken. The important thing for me was that the students were reading. 8. Wee mail--(Twice a week) At our school, we have the Wee Mail program set up where students write letters to friends and teachers and it goes through the mail system. During this time, the students were allowed to write letters to friends that did not and could not (due to time) get written at other times. This increased the amount of writing in the classroom. of the basal) and those groups were left as multi-ability groups. I had about an hour and a half each day for centers. Some days less depending on time. I did not do SSR after I started centers because there was plenty of reading and choice that the students were doing. I always introduced the WWW on Monday using Working with Words, but some days during the week this was left out (the students had the center to work with the words). I am planning on using centers all year next year. I definately saw the benefits, such as increased indepence among my students. There were a few who did not use there time wisely, but for the most part the students loved! the idea of being able to work at their own pace. Reading scores went up, so I know that the reading helped and most used the time wisely!! I am know that this e-mail is long, but for those of you that read it, I hope that it gave you some ideas that you could use. If something is not clear, please ask questions. If this sparked ideas or you have some of your own, please share. I just came from a 2 day workshop on Lit Centers for K-2. The presenter said she divides her class into groups of no more then 4, One high, one low and two ave. She does centers for 2 hours and 20 min. The centers are: Writing Activity, 2 practice reading(one for guided readers they have been using in group and one for free choice or AR), a listening center with about 40 taped books available, working with words center and an optional activity center for theme, MAth, Sci,SS, or computers. They are every center every day. She calls a guided reading grooup every 20 minutes, so they come from differnt work groups to be in their ability group for guided reading instruction. The last 20 minutes is a make up time for whatever center they missed at Guiding Reading time. In the writing center they do a journal activity, step book, pop-up book, shape book, friendly letter, post card, lists, response to reading, etc. At the working with words she has an assigned activity every day too: Bingo, Rivet, Pocket charts, and I can't remember them all.....it's in my notes. Anyway if you have questions you can email me back. Dialogue Journals/Poem Illustration: Students write to me in their composition books in the form of a friendly letter and I write back. It's a great way torecord growth and is a super assessment tool. I like doing them as a center because I only have 4-5 to write in a night. When they finish with their d.j. they illustrate the poem of the week that will beadded to their poetry notebooks on Friday. I started adding this to center time because they could do it completely independently and it seemed like I wasn't using time wisely when we gave up 15 minutes for the hwole class to stop and illustrate a poem. Reading Center: Listening Center with tapes is commonly used for this center. My kids need to do some type of response to it when they are finished. This center might also feature some type of extension activity that is going along with whatever story we're reading whole group. Getting out some big books, reading around the room, etc. are all options for this center. My fourth center each week is usually my only one that I need to think and plan for. I often have some type of activity that correlates with our science and social studies themes but involves reading and writing. For instance, during dinosaurs, the kids completed (wrote and illustrated) a flip book with five facts they learned about dinos. They also enjoy\par when we do research at this center. During the oceans, they had to choose a book about an ocean animal from the tub, read it, and then create a 3-dimensional cubes with facts/illustrations. 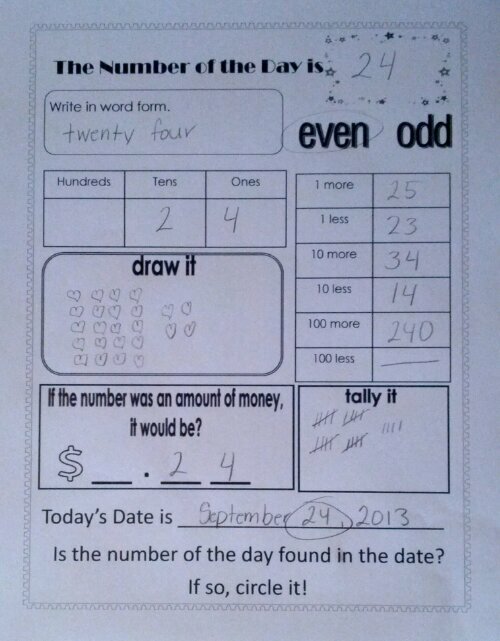 I also may make this be a math center: writing word problems, creating a menu to use during a math lesson on money, etc. Finally, if I have a very cool art project that I don't want to take time away from my large group instructional time to do, I'll have the kids do it during center. I tend to limit my centers to reading/writing activities, but I figure one that is just art won't hurt from time to time. The easiest and most popular centre (station) in my room this year is Writing Around the Room. We didn't do this one until later in the year but they love it. I cut up the long sheets of foolscap in half and I have 4-5 clipboards all stored in a box. Each child gets a clipboard places a sheet of paper on it and then for the next 15-20 minutes they literally write around the room. Many copy the daily morning message or parts of it. Others make a list of words from labels around the classroom or word wall words or copy friends names off of charts around the room or book titles off the shelf. A few on my students are drawing things at first but usually label them as well or at least try. At the end of the station time (I set a timer bell) each student date stamps their sheet and places it with their name and number on it in the finished box. I don't mark these but I can see what they did in that time period. I file these in their archive and then they go home with everything else once we pull 3 items for our portfolios. You can also do reading around the room with a few pointers and then they partner up and take turns reading around the room to each other. I agree with Addie, spend LOTS of time explaining and modeling how things work and give lots of praise, positive reinforcement... I have had to try several different methods for center time. Each teacher is different, so what works for one may not work for another. I am currently searching for another new method for next year, but here is what I have tried over the years:Free choice centers= lots of time spent at the beginning of the year modeling, etc.., kids get to choose their centers independently. During this time I would work in small groups on activities, projects, guided reading, etc...This method was my favorite until I lost my assistant due to budget cuts. The kids get to become independent and make their own choices and become accountable for their own actions.Rotation centers= This is the method I had to go to after my assistant was cut. I found that I had too many students to circulate around the room independently without a "go to" person in case of emergency or other mishap. I was spending all of center time taking care of little things instead of getting any work done in small groups. I used Microsoft clip art and some real photos of each center in the room to make groupings of centers. On a red piece of construction paper I put 3 pictures; Computers, blocks, puzzles etc... Then on yellow 3 more centers and so forth, you get the idea. Then the kids were grouped into colors and I tried to seperate the troublemakers into groups with the level headed ones. Each day each group had 3 centers to rotate through and there were 3 "free" centers that they could visit if they were finished with all 3 centers. This seemed to work and take care of alot of problems during center time, but I just felt like I was cheating the kids out of alot of things. centers if they start to get bored as well. I take digital pictures of all the centers, lamintate, and velcro them. After 20 minutes, the kids rotate to the next center. They will only do three literacy centers per day. One of these will include a thematic lesson (various depending on what we are working on), others include ABC stamps to spell words on the word wall, letter tiles, abc boards matching magnets to alphabet letters, headphones, magadoodles, leappads, etc.